It is an undeniably exciting time to be working in the impact-investing space. As a sector, we have taken off the training wheels—or, if you prefer, we’ve let the scaffolding fall—and we’re now in a new phase of scaling and replicating successes, pioneering new policies and legal entities, and building the infrastructure that will enable us to move from the margins to the mainstream. Within Canada, the impact-investing sector is expected to grow from $5.3 billion to $30 billion over the next decade. The MaRS Centre for Impact Investing have been seeking ways to take impact investing further. We could ride the wave, but how do we grow the wave? How do we break down barriers within the global impact-investment space and bring more investors together with ventures in person to catalyze capital and achieve more change? How do we bring global impact investing to Ontario and showcase our province’s spectacular impact-investment opportunities to investors regardless of borders? 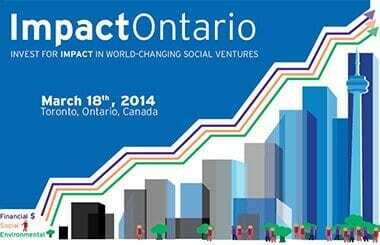 Enter ImpactOntario, a landmark conference that brings world-changing Ontario ventures together with world-leading investors and intermediaries with the aim of answering all of these pressing questions. ImpactOntario is designed to support deal flow and impact-investing opportunities through pitch sessions, one-on-one meetings and plenary panels. The event will spotlight ventures across a variety of sectors, including health and wellness, sustainability, education and technology, and inclusion. There will be great networking opportunities, a strong venture pipeline pitching for capital through open and closed pitch sessions, and outstanding content. Today, we are incredibly excited to announce some of the stellar speakers and the rollout of our program for the day. Eric Hoskins, Ontario’s Minister of Economic Development, Trade and Employment. Whether you’re interested in identifying investment opportunities, exploring cross-sector funding opportunities, networking, scaling your impact, diversifying your portfolio or just learning more about the space, ImpactOntario will be an event you can’t afford to miss. For more on the conference, visit the ImpactOntario webpage. Better yet, register now! Tickets are going fast, and our early-bird conference rate ends February 28. Stay tuned! In the weeks to come we will be profiling some of the world-changing ventures and world-leading investors who will be at ImpactOntario, and we’ll also be announcing more excellent speakers.